Considered by many to be the national dish of Brazil, feijoada is a hearty stew of black beans, smoked pork, and beef. 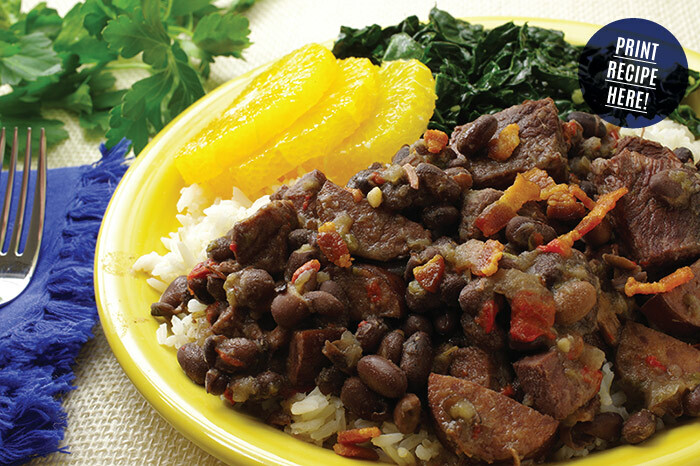 Feijoada, pronounced as “fay-ZWAH-da,” varies by region and local preferences. 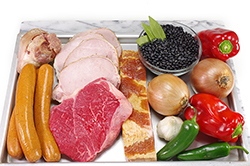 It’s a multi-hour simmering process that coaxes the smoky flavors into the beans while tenderizing the meat pieces. It’s also the perfect application for a slow cooker. Traditionally, this dish was made on Saturdays for a crowd of family and friends, and typically served over white rice with slices of fresh orange, and a side of garlicky, braised greens. 1. 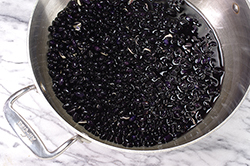 Soak the beans overnight by rinsing the dried beans and covering with water in a large pot. The beans will absorb liquid, so ensure the water line is a couple inches above the beans. Alternatively, “quick soak” the beans by bringing the beans to a boil in a large pot, turning off the heat and allowing the beans to steep in the hot water for an hour. Rinse the beans, (soaked with either method), and place in a 6 qt. slow cooker or 7 qt. Dutch oven. 2. In a large sauté pan, brown the bacon that has been diced into half-inch pieces. When browned, transfer the bacon bits to a paper towel-lined plate and set aside until time to serve the feijoada. 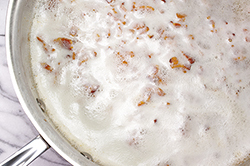 Remove all but 2-3 tablespoons of the bacon grease from the pan. 3. Sear the chunks of beef chuck in the hot bacon grease until browned on the surfaces. Work in batches to keep the temperature steady and hot throughout the process. Transfer the seared pieces to the slow cooker or pot with beans. 4. Prep and cut the smoked pork chops and spicy sausage; add to the bean pot. Add the smoked ham hock to the pot as well. 5. Sauté the onions in the sauté pan with bacon grease for 3-4 minutes. 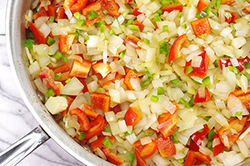 Add the red pepper and jalapeno peppers and continue to sauté until just tender. Add the crushed garlic and sauté another minute. Transfer this aromatic mixture to the bean pot. Add the beef broth, vinegar and bay leaves to the pot. 7. An hour prior to serving, make the rice. Use a 1:2 ratio of rice to water. Bring the water and rice to a boil, then a low simmer for 15-20 minutes or until tender. Meanwhile, prep the greens by washing, removing any tough stems, and tearing into smaller pieces. Heat the olive oil in a large sauté pan, add the greens and garlic. 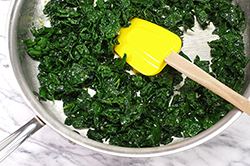 Toss with a pair of tongs as the greens wilt. 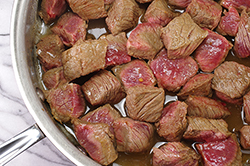 Turn the heat to low, cover, and allow to braise for 10 minutes or until completely wilted and tender. 8. Spoon the feijoada over the white rice, sprinkle with the reserved brown bacon. Serve with the braised greens on the side. Garnish with a couple of orange slices place on top.